Banana bread recipe – no more banana waste! It’s time to stop wasting bananas! Here is a banana bread recipe you can do to use overripe bananas. Better than throwing them away, right? Give it a go! How to be more productive? It’s all about taking the right habits! And sometimes, it’s just one step away! Click to get 10 tips to be more productive. Wow! Another award?! I can’t believe that I’ve been nominated for the Versatile Blogger Award! Click if you want to get to know me! Tired of having the same exact breakfast every day? Then you should check these 10 breakfast ideas to get some inspiration. Create a YouTube channel – Yes or No?! Should you? Should you not? You feel like you need tips and advice before creating your YouTube channel and starting this new adventure? Then click and read! Nominated for the Sunshine Blogger Award! Having the privilege to be nominated for the Sunshine Blogger Award is really flattering! Such a great and unexpected surprise! Click to find out more about what happened! 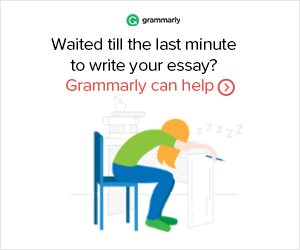 Grammarly is an automated grammar checker you can get for FREE and seriously, it’s a precious tool to have as a blogger!